Comic Towel: What? Some Fantasy Novels...? 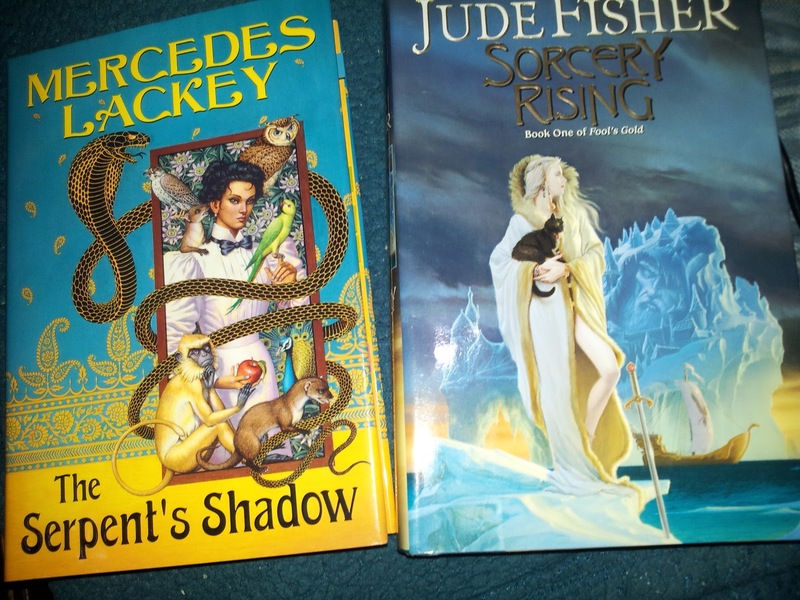 I told myself “what the hell” today and grabbed these two fantasy novels out of the library used bookstore for a $1 apiece. As mentioned in the past, the fantasy genre isn’t my strong suit; Urban Fantasy I can nail, given the right ingredients. Nonetheless, high fantasy–as I’ve learned in the past–takes me an unbelievable amount of energy to focus and survey my way through. Seriously, with high fantasy you’re thrown into a whole different world of concepts, systems, and ecospheres that allows you little to no reference points to consider. So I find it troublesome when I attempt to unfold the author’s imagination through my own–at the same time. Or at least that’s how it feels to me when an author is pounding descriptive exposition of a fantasy empire built onto a water way; congregated by humanoids and humans with varied ascetics not remitting my needing a visual clue. So it always feels like a gamble when I take on these books. A gamble of cohesion and comprehension of the events and narrative flow through an author's particular style. Yet, there’s a wall I want to break to get into these alien and fantasy worlds. And that’s how I browsed my way to Jude Fisher’s Sorcery Rising (Book One of Fool’s Gold) and the infamous Mercedes Lackey’s The Serpent’s Shadow. Both their selling points: they feature female leads. Nonetheless, The Serpent's Shadow's lead is a half-Indian woman named, Maya Witherspoon. Which really caught my attention. Other than that, both leads partake in an adventure of some sort. Oh, and magic will be had. Should I jump ship for whatever reason, everyone will be the first to know. Share your thoughts on high fantasy and these authors.